A quick and easy recipe is a great thing to have – if you’re short on time, short on energy, or even if you have tons of time! 😉 This PF Chang’s Mongolian Beef copycat recipe from Damn Delicious is exactly that! I have found Damn Delicious to be one of my newest cooking blog addictions – the recipes are typically pretty simple with minimal ingredients. Moving right along – there is not really much to say about it, as it’s pretty straight foward! I have to admit, though, that while I loooooove PF Chang’s, I have not been there in years, so I am not sure if it’s a true copycat. 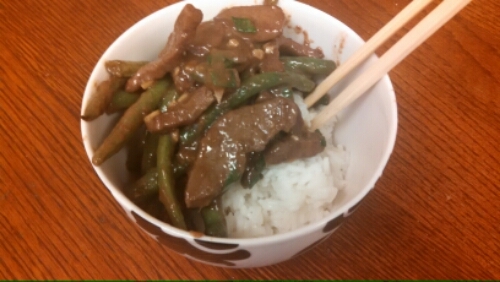 Also, I added some green beans for a vegetable. -In a medium bowl, whisk together soy sauce, brown sugar, garlic, ginger, 2 teaspoons vegetable oil and 1/2 cup water. -Heat the mixture in a medium saucepan until slightly thickened, about 5-10 minutes; set aside. -In a large bowl, combine flank steak and cornstarch. -Heat 1/2 cup vegetable oil in a large saucepan. Add beef and fry until browned and cooked through, about 1-2 minutes. -Transfer to a paper towel-lined plate and discard excess oil. 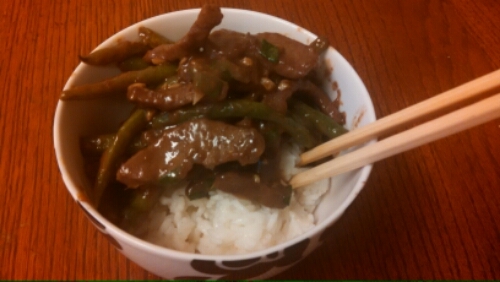 -Add beef and soy sauce mixture to the saucepan over medium heat and cook until sauce thickens, about 2-3 minutes. Stir in green onions.